Macular edema is caused by disruption in the normal permeability barrier of the retina, the blood-retinal barrier (BRB). 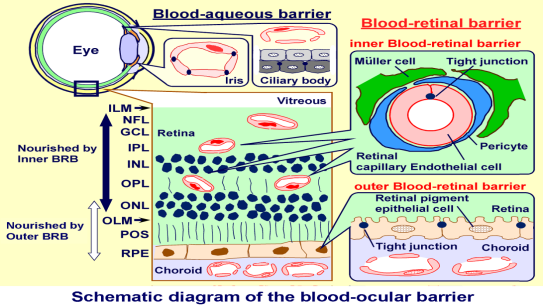 The blood retinal barrier is responsible for restricting movement of plasma constituents into the retina and in maintaining homeostasis. The outer retinal barrier: composed of tight junctions between the retinal pigment epithelial (RPE) cells. When the BRB is disrupted, the volume of the extracellular space of the retina expands due to unrestricted entry of protein and water from plasma and thus macular edema (swelling) occurs and the vision is affected. Who is at risk for Macular Edema? Various etiologies exist for the development of macular edema. Inflammation is among the factors implicated in BRB breakdown (uveitis in general but the types of uveitis most commonly associated with macular edema are: pars planitis, iridocyclitis, birdshot retinochoroidopathy, sarcoid uveitis and HLA-B27 uveitis). Other factors include metabolic alterations (diabetes, retinitis pigmentosa), ischemia (severe hypertension, toxemia of pregnancy, collagen vascular disease, disseminated intravascular coagulopathy), increased capillary pressure (venous occlusive disease, systemic hypertension), severe ocular hypotension, mechanical forces(epiretinal membrane), post cataract surgery (Irvine Gass) and medications(epinephrine, betaxolol, latanoprost). How is Macular Edema detected? 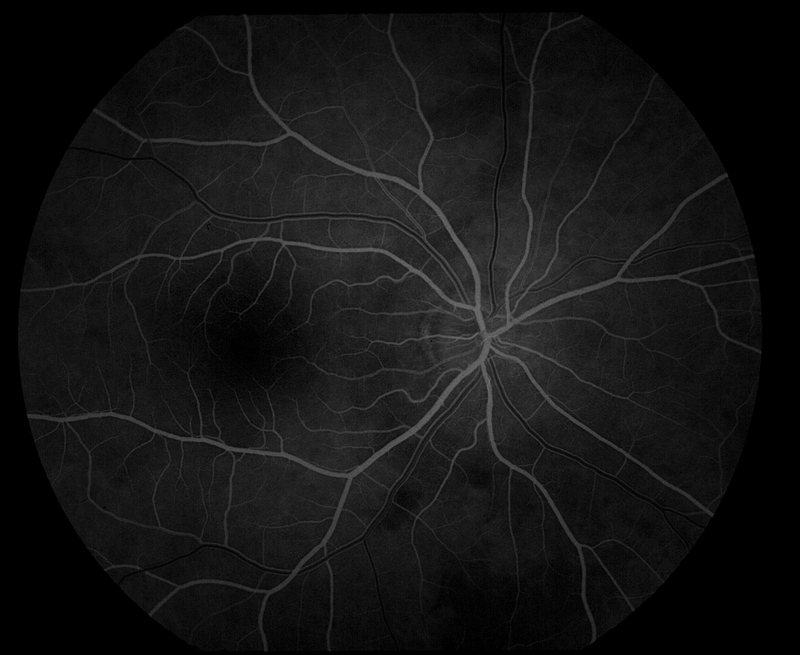 The clinical gold standard for the detection of macular edema is fluorescein angiography, but OCT scanning of the macula has become an important diagnostic tool as well. Optical coherence tomography (OCT) has emerged as a useful imaging technique by providing new high-resolution cross-sectional information about various pathological features of the macula. It allows clinicians to quantitatively measure retinal thickness in a reliable and highly reproducible manner to detect and monitor therapeutic effect post treatment of disease. The measurement of retinal thickness is important in quantifying macular edema or abnormal fluid accumulation within the neurosensory retina, which often leads to macular edema. 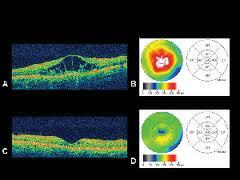 It is important to measure macular thickness in order to track the progression and treatment of macular edema. Fluorescein Angiogram (FA) may also be used. If you need reading glasses, please wear them while you use the Amsler grid. The grid should be at about the same distance from your eyes that any other reading material would be (about 14 inches). You can mark areas of the chart that you’re not seeing properly and bring it with you to your eye exam. Does Macular Edema have any symptoms? The treatment modalities of treating macular edema are rapidly expanding, due in part to more recent clinical trials and in part to our unique position to benefit from innovations in both the retinal drug delivery and better understanding of the pathophysiology.